Forbes was quick to report that Facebook changed all user emails to a ‘facebook.com’ domain today – a pretty sneaky move on their part to do so without permission or notice. Back in 2010, Facebook launched its own email service, and many predicted it would be the death of email. That was hardly the case. Email is alive and well, and most people don’t even realize they have a Facebook email address. Is this a move by Facebook to increase the adoption of their email service? Our guess is yes. Click on your name in the top right corner of your Facebook page. Click on ‘Update Info’ tab located just below your cover photo on the right side of the page. Locate your ‘Contact Info’ and click the ‘Edit’ link. 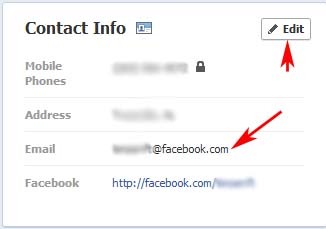 While speaking of email addresses, we recommend that you use a totally separate email account for Facebook. Don’t use the same email address that you use for sensitive accounts. For more information on configuring your account and privacy settings, be sure to check out our post: How to Lockdown your Facebook Account for Maximum Privacy and Security.